Heirloom tomatoes are renowned for their amazing range of flavor, color, shape, suitability for specific growing conditions, and true-to-parent seed saving ability. 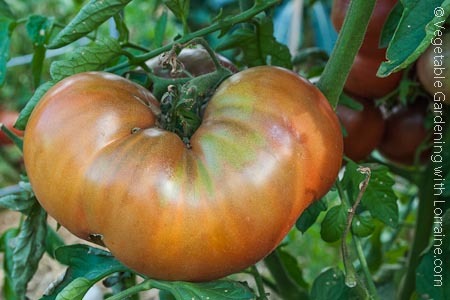 Below is a photo of the queen of heirloom tomatoes: a ripening Brandywine. Brandywine tomatoes are too big and odd-shaped to be of interest to commercial growers. 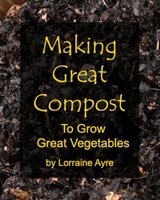 But their awesome flavor has made them favorites of gardeners everywhere, and they are one of the best reasons to get into vegetable gardening. Biting into a Brandywine or other heirloom tomato is an experience you can't buy from the grocery store. To be considered an heirloom, a tomato variety must be open-pollinated and have been grown true-to-parent for at least 50 years. This means that when pollinated by itself or another of the same variety, the seeds will grow into tomatoes with exactly the same qualities as the parent. Hybrids were developed from heirlooms in order to enhance specific qualities, such as disease resistance and commercial and shipping benefits. This not a bad thing, it’s just that these might not be the same qualities that you as a home gardener are looking for. Heirloom tomato varieties may be determinate, meaning they grow to a certain size and then produce their crop of fruit, or indeterminate, meaning they keep on growing, sprawling and producing fruit forever (or until killed by frost). Black Krim My friend Ashley at Sturtz & Copeland calls this “the ugliest tomato you’ll ever LOVE”. She’s right. Brandywine A consistent taste-test winner. I love these, but hear they don’t do well in intensely-hot climates. Indeterminate, late bearing. Roma The classic, sweet, drier-fleshed oblong tomato used for homemade sauces. It’s a determinate variety, so it bears all at once. Prepare for a big sauce-making Saturday sometime in August. Amish Paste Wins a lot of taste tests for good reason. Slightly larger than romas and indeterminate. Jaune Flamme Orange-red and slightly tangy. Indeterminate. Yellow Pear Beautiful in shape, color and flavor. Bountiful indeterminate. Blondkopfchen The awesomest! Kind of a transparent yellow with unsurpassed flavor. Gary over at TomatoFest.com says: “I have had this in our garden as our favorite snacking tomato for many years and use this cherry tomato for introducing tomatoes to kids who claim they don't like tomatoes. Just put this in your mouth and see if you can keep from smiling.” Dare ya! Indeterminate, early yields. Silvery Fir Tree A smaller, determinate plant with silvery, fernlike leaves that is a good container plant. (Great as upside down tomatoes in planters, especially in cooler regions). Disease resistant, too! 55 days. Stupice Originally from Czechoslovakia, Stupice is a very sweet, small to mid-sized tomato that bears early and prolifically. Especially good for the northern tier. 52 days to harvest, indeterminate. Oregon Spring made me win the Cottonwood Canyon (Montana), unofficial earliest-ripe-tomato-in-canyon contest in 1997. My neighbor Sil was jealous! Gary Ibsen’s Tomato Fest Catalog The best and most comprehensive information you’d ever want to know about heirloom tomatoes, as well as a great place to order seeds. It's an online-only catalog. Seven Acres Heirloom Tomato and Vegetable Seed Catalog These guys have heirlooms of lots of different vegetables, including tomatoes.